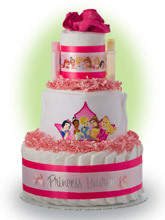 Information, advice, pictures and articles about lil baby diaper cakes. He’s over 80 years old now, but still as popular as ever. His name is Winnie the Pooh and his name is loved by children (and adults I may add) worldwide. I did some digging around and at one point Disney reported revenues on Pooh products of over 1 Billion dollars, about the same amount as Mickey Mouse, Minnie Mouse, Donald Duck, Goofy, and Pluto combined! Who would have thought such an simple looking bear created by A.A. Milne, an English author would have grown into such an iconic figure. His first book was released in 1929. In case you are wondering, the name “Winnie the Pooh” was coined by Milne after a teddy bear owned by his son Christopher Robin Milne. This original bear is on display in a public library in New York City. 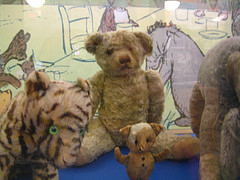 The picture shown above left is the original bear owned by Christopher Robin Milne. Notice another familiar name? Christopher Robin of course is the fictional character who became Pooh’s best friend. He was named after Milne’s son. And so begin the rise of a wonderful children’s story that many of us can remember growing up ourselves and of course then sharing with our children. If you look at the picture you will notice Pooh didn’t have his popular red shirt. The first artist version of Pooh with the red shirt occurred in 1932 by Stephen Slesinger, the man who licensed the use of Winnie the Pooh from Milne only 2 years earlier. (Incidentally, Mr. Slesinger was known as a pioneer for licensing literary characters.) There were no plush Pooh toys with the red shirt until the 1940s. A lady by the name of Agnes Brush created these new designs. I checked some auction sites and you can still find original Pooh plush toys from the 1950’s with his red shirt available for purchase. In 1961, the late Stephen Slesinger’s wife, Shirley met with Walt Disney and a licensing agreement was created with Disney for Winnie the Pooh. With the Disney name behind Pooh, his popularity soared even more. Movies, animated features and of course virtually everything you can put a Pooh image on was produced. For the next 30 years the Pooh brand grew with Disney doing what they do best: marketing! It wasn’t until 1991 that a bump in the road occurred. That “bump” was the Slesinger family suing Disney for breach of contract regarding royalties. Many court cases ensued with a settlement reached in 2009–a full 18 years of legal wrangling! 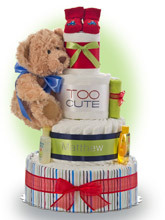 Over the years, Lil’ Baby Cakes has featured a diaper cake using Pooh with his red shirt pooh and the classic Pooh. I have always like the classic Pooh and am now happy to offer our latest rendition of the Winnie the Pooh diaper cake. This is a 4 tier design built using 70 Pampers Swaddler diapers featuring a classic Pooh plush toy. I dressed this design up with a flannel receiving blanket, Pooh themed accoutrements, and the Burt’s Bees getting started products. This design is a great way to pass the legacy of Winnie the Pooh story to the new family. Long after the diapers are gone the newborn boy or girl will have classic Pooh plush toy as a lasting remembrance of a classic story. As with all our designs, you can have this shipped to the new family along with your personalized gift card welcoming the new baby home. I welcome your thoughts about Pooh and our latest design in the comments section below.